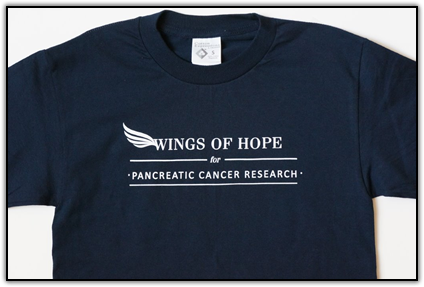 Your donation to WINGS OF HOPE for Pancreatic Cancer Research goes directly to raise awareness and help fund the ongoing pancreatic cancer research at the University of Colorado Cancer Center. After you have filled out the section below, please click the DONATION button and you will be taken to PayPal to donate any amount you choose. If you do not have a PayPal account, they are free, secure and easy to set up, or you may donate via check. Our heartfelt thank you for helping in this cause. When making a donation, please specify the person for which this donation is made in the box labeled 'in honor of' or 'in memory of' as you are completing your donation at PayPal. This will allow us to inform the family of your thoughtful gift. 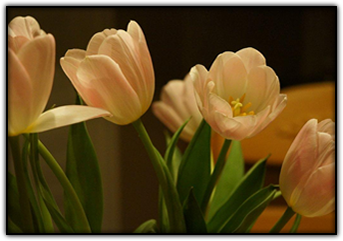 Thank you for your support of this effort. 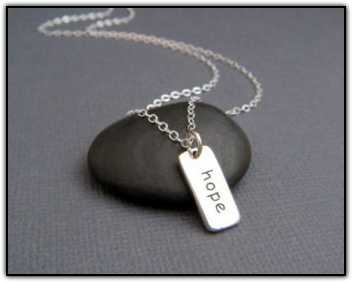 Wear your HOPE proudly with this sterling silver 18" HOPE necklace made for WINGS OF HOPE. All proceeds go to the University of Colorado Cancer Center for pancreatic cancer research. 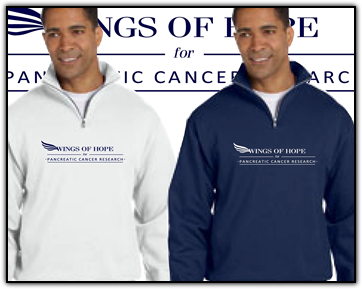 Show your support for pancreatic cancer research with this smart looking sweatshirt. Signify color and size. SHOW YOUR SUPPORT of the fight against pancreatic cancer.